Courtesy photo by Natalie Ertz A black wolf prowls the land near Flat Top Ranch. Local wolf advocate and tracker Natalie Ertz said the above wolf was one killed by Idaho Wildlife Services agents Wednesday in response to a depredation at the Flat Top Ranch near Carey. Three wolves were killed by federal Wildlife Services on Flat Top Ranch near Carey on Wednesday in response to a series of reported depredations. Todd Grimm, Western District manager for Idaho Wildlife Services, said a control order had been issued on the pack after the wolves attacked and killed a calf at the Flat Top Ranch on Saturday night. No specific number of kills was assigned, but agents killed three black wolves on the property early Wednesday. Grimm said he wasn't certain how old the wolves were, but said none of the ones killed were this year's pups nor the pack's lone radio-collared female. "A 2-year-old wolf looks like an 8-year-old wolf from the air," he said. Landowner and rancher John Peavey said the wolf pack attacked and killed one of his calves on Saturday night. Four sheep were originally suspected killed by wolves, but were later confirmed as coyote prey. "[Wolves] have killed numerous animals all summer," Peavey said. "Once they start eating beef and lamb, I think they're hooked." Peavey has been an outspoken skeptic of the nonlethal methods promoted by wolf advocacy group Defenders of Wildlife, and Tuesday accused the wolf pack of crossing an electric fence and killing four sheep despite the guard dogs that were present both nights. "Guard dogs are pretty well intimidated by several wolves," he said. Wolf advocate and tracker Natalie Ertz said Tuesday she wasn't convinced the livestock deaths were due to wolves. The area is home to coyotes and bears as well as wolves, and Ertz said she heard the pack roughly eight miles away from the Peavey ranch just hours before the reported depredations occurred. Though wolves can trot at speeds up to 10 miles per hour, Ertz said, it's "unlikely" that the wolves made the trek either night. "There's no third-party verification that the depredation was actually a wolf," she said. "There should be an objective third party involved." Grimm said the calf depredation was confirmed by a Wildlife Services agent on the scene. "This was pretty obvious, especially as the collared wolf was standing right there," Grimm said. Grimm confirmed Thursday afternoon that the four sheep were killed by coyotes, four of which were killed by service officials Wednesday. Peavey had several more sheep attacked on Wednesday night, though Grimm could not confirm if the sheep were attacked by wolves. Grimm said the pack's radio-collared female had been tracked from a pack in Fairfield. The wolf survived the control order, along with at least one other adult and an estimated three to four pups. As for the origin of the remainder of the wolves, Grimm said he wasn't sure. "They may be remnants of the Phantoms, I don't know," he said, referring to the former Phantom Hill Pack that resided in the northern Wood River Valley. 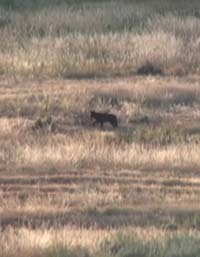 According to Ertz, the pack was likely the same one that had been involved in depredations at Cove Ranch south of Bellevue in early June. A control order had been issued after that incident, but no wolves were killed at that time. This is the third control order that the pack's alpha female has survived. Ertz said the female has survived three coyote traps as well, is missing two toes on one foot and has a severe injury on another, causing her to limp. Ertz and Suzanne Stone, spokeswoman for Defenders of Wildlife, agreed that the survival of the female gives the pack a better shot at survival, though the impact of the three deaths will be a shock to it. "We're talking half of the pack most likely gone," Ertz said. "It's absolutely devastating to the pack dynamic. When a pack loses half of its members, they're way more likely to pick easy prey." "Sometimes when you get a heavy hit on a pack like this, the pack tends to disintegrate," Stone said. "I don't know how they are going to respond to it." Though Grimm was reluctant to say whether more wolves would be killed, he did say Wildlife Services would not kill the radio-collared female and likely would not carry out any more lethal controls. "With where we are in the grazing season and the hunting season, unless we get something in the next couple of days, we're probably going to be done," he said. But three wolf deaths won't make up for the death of Peavey's sheep, Peavey said Wednesday. "Someone offered me money for the animals we lost," he said. "I told this person, that's not the point. We love these animals, and we go through great lengths to keep them happy and healthy and alive." The first reported wolf kill of the 2011-12 hunting season has been filed, said Idaho Department of Fish and Game Officials Thursday. The wolf, a black male, was shot in the Island Park Zone in eastern Idaho on the first day of the hunt, Aug. 30. No wolves have been killed so far in the Southern Mountains Zone, which encompasses the Wood River Valley. Niels Nokkentved, spokesman for the department, said no other wolf kills have been reported so far, but hunters have 72 hours to report a successful hunt. "It doesn't mean they haven't been killed, they just haven't been reported," he said. "There could have been a hundred of them killed and we just don't know it." According to Nokkentved, the number of wolf tags sold has skyrocketed to 9,048 resident tags and 655 non-resident tags as of Thursday morning.